Fruit to celebrate a new arrival. The wait is over. The hard work a memory. Now the new parents can take a moment to catch their breath by enjoying your gift of ripe, juicy fruit. 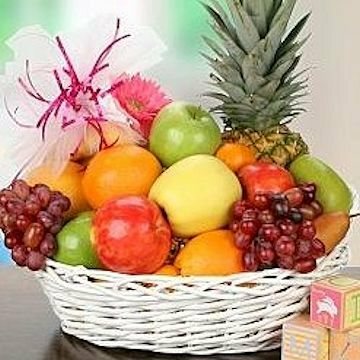 The classic basket, decorated for the occasion, is loaded with the finest local and tropical fruits available. Expect the assortment to include items such as pineapple, oranges, apples, kiwi, pears, or grapes.